Removing built-up dirt, algae and stains gives brick a fresh appearance, boosting your home's curb appeal and property value. Use a pressure washer to make this daunting task quick and easy with long-lasting results. 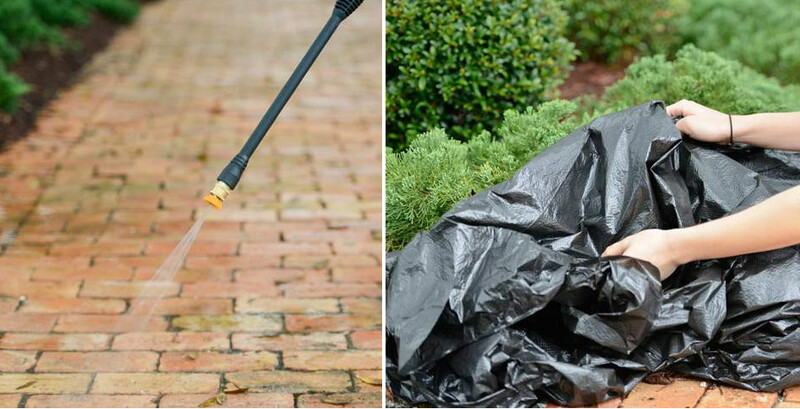 The high-pressure hose blasts grit and grime from brick, stone and concrete so you can clean not only your brick but also your driveway and sidewalk. 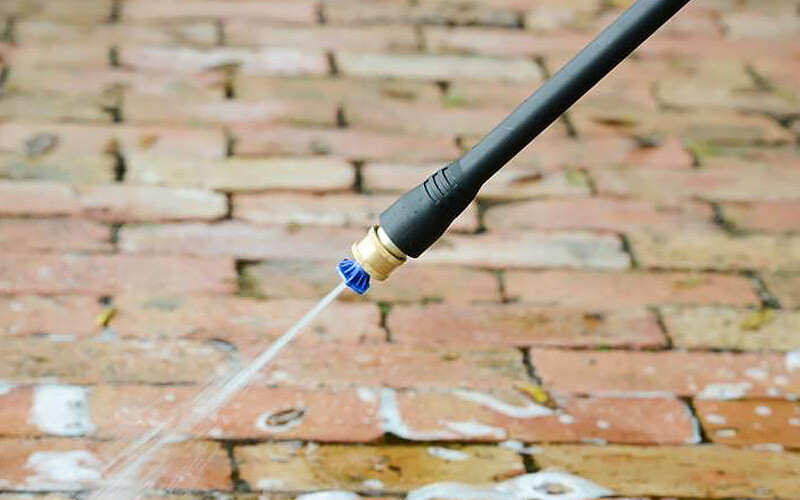 This guide will teach you how to effectively use a pressure washer for basic outdoor cleaning tasks. Tip: You can purchase a pressure washer of your own or rent one from The Home Depot. Safety: When using a pressure washer, wear safety glasses and shoes that won't slip on wet surfaces. Look for any cracks in the brick or mortar; these will have to be repaired before pressure washing. Cover and protect light fixtures, electrical outlets and jacks with a waterproof material so water won't be forced into them during cleaning. Cover nearby shrubs, bushes and flower beds. Ensure that windows are tightly sealed. Tip: Some old bricks can't stand up to pressure washing. If you live in a century home, consider getting a professional opinion. Use a low-pressure nozzle on the pressure washer to spray on your selected detergent from the top to bottom of a wall, or from one end of the sidewalk to the other. Let the detergent sit for a few minutes so it can break up surface dirt and stains. 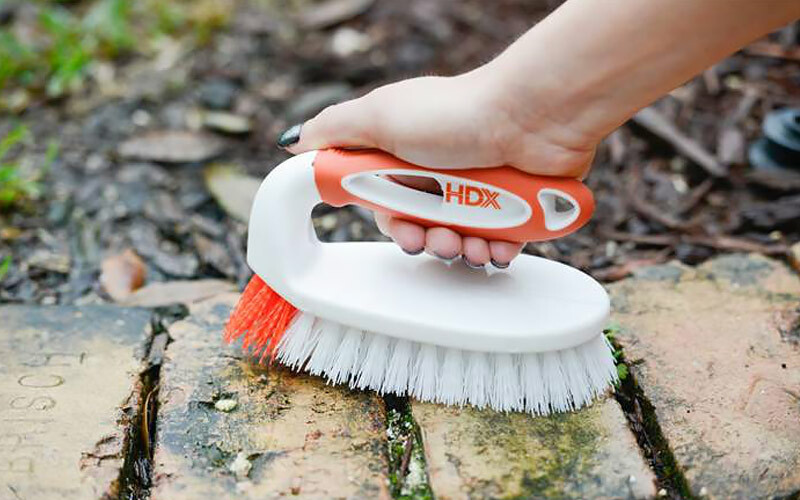 The product packaging will indicate how long to leave it before high-pressure washing/rinsing. Use a surface-cleaner attachment or higher-pressure nozzle to clean the brickwork, again working from top down. Spray in horizontal strokes over a 3- or 4-foot-wide area at a time. Start with moderate pressure and follow the manufacturer's instructions for the ideal nozzle distance from the cleaning surface. Increase the PSI (pressure) as needed. Use a garden hose to thoroughly rinse nearby surfaces, such as the driveway, walkway, patio and soil of detergent residue. Safety: If working on a wall, use an extension attachment — never stand on a ladder when pressure washing. Check your brickwork after it has thoroughly dried, after a day or two. 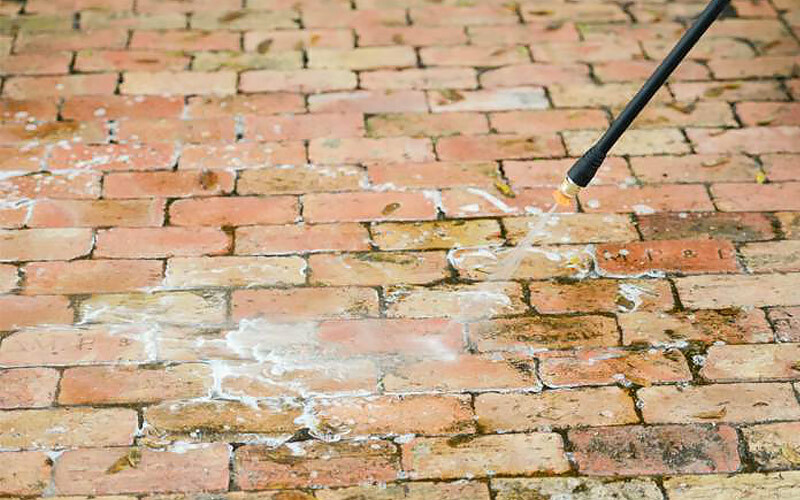 Spot-treat any leftover stains the pressure washing left behind, such as stubborn mildew or algae, or set-in rust or masonry bloom. Wet the stained areas with clean water and cleaner with a sprayer or, for especially persistent stains, a wire brush. For mildew and mold stains, mix equal parts chlorine bleach and water. For mortar stains and rust, dilute an acid-based masonry detergent following the manufacturer's instructions.